In many UFO sightings, craft are seen to accelerate to speeds estimated at as much as 10,000 mph. Although this should create a shockwave that would cause serious damage on the ground, never mind the sonic boom you should hear, the craft seem able to move through the air without displacing it. Most UFOs don't appear to be very - or at all - aerodynamic, and saucers are often seen to travel straight up while in a level posture, the least aerodynamic way they could move. One suggestion is that the craft generates an envelope of warped space around itself. While that could account for UFOs that are seen to just disappear, it wouldn't account for craft seen flying at high speed ( by eye or radar ) because a space warp would bend light around the craft. So, I'd been thinking about the inertia cancelling field ( ICF ) that UFOs need to have to prevent their extreme-G stunts splattering the contents of the craft ( biological or mechanical ). The ICF would have to extend all around the craft in an invisible shell. 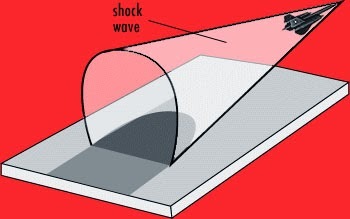 Air molecules would be rendered inertialess before they hit the craft's hull; the air could flow over the hull and return to its previous state as it passed out of the ICF on the trailing edge of the craft's hull, being effectively undisturbed by the craft's passing and therefore not generating a shockwave. Photons would be unaffected, because they're massless, so you could still see the craft flying off at several thousand mph. Anyone see a flaw in that theory? Please comment if so.